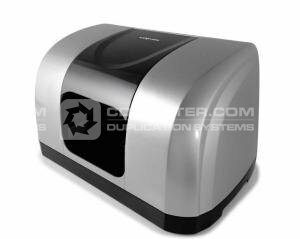 The USB Clip Printer is ideal for short run print runs for either single color or full color logos. The inkjet printable clips are of standard size and will fit nearly all swivel style USB flash drives. The process is simple. Print your logo from our easy-to-use software interface directly to the matte white clips. The prints are instantly dry and highly water resistant making it a perfect solution for quick turn USB branding jobs. Finally, swap the clip from your current drive with the all new printed clip. Easy. Fast. Economical. The USB7P will print seven USB clips in full color in about 35 seconds. The USB7P uses a CMY ink cartridge and Black ink cartridge. The prints are beautiful, vibrant, immediately dry after printing and highly water resistant. From Nexcopy simple user interface print seven clips with the same logo, or seven individual logos all at the same time! The possibilities are endless with the all new USB7P! Based on Hewlett Packard inkjet print technology, the USB Clip Printer is an ideal office product for quick labeling of flash drives in monochrome or full color. The Nexcopy inkjet printable clips are compatible with most standard swivel drives. The USB7P uses the inkjet printable clips made by Nexcopy and clips are print ready on both sides. Why is the USB7P a cost benefit to your company? Convenience. No need to ship product to a print shop or wait 7-10 days for a contract factory to print logos. Print instantly and in full color. The Nexcopy USB Clip Printer is a cost-effective solution. Get more done in less time. Ease-of-Use. The USB7P print software is extremely easy to use. Select JPEG or BMP images to be printed and easily size the image to fit the printable area of the USB clip. There is no need to deal with vector artwork, making screens or dealing with costly setup fees. Flexibility. The Nexcopy inkjet printable clips accommodate nearly all standard swivel drives in the market. Swivel drives are the most common USB body style and the process to swap clips is simple and straight forward. With the USB7P ability to print over 11 million different colors you have the flexibility to print any logo in complete full color. Nexcopy . USB7P . USB . Clip . Printer .